Truvia – A calorie free sweetener, perfect little samples! Thinable Cinnamon Swirl – these are so thin and tasty, they literally melt in your mouth! More please! Goodie Girl Cookies – Tried these before, lovely little GF cookies! Dave’s Sweet Tooth – ERMERGERD I opened the package so quickly I had to hide it under the other for this photo! So yummy! Luckily they sent 2 packs, loooove love love! Fav item this month! Door County Potato Chips – Super yummy chips, happy they sent 2! Ginger Honey Crystals + Ginger Candy – got this sample pack in another subscription box and love ginger so was happy for another! Red Plate Foods Cinnamon Berry Granola Snack – great vegan granola for my morning yogurt parfait! Dark Chocolate Creme de Pirouline Rolled Wafers – yum I love wafers, perfect when dipped in my morning coffee for an extra sweet morning. TruffleCremes by Dilettante Chocolates – mmmm yummy little treats that I’ve been keeping in my purse for a special treat throughout the day! Emmy’s – I’ve tried these a few times, they are sooo yummy and always a healthy treat option for a hike or when you want a snack! We got a Vanilla Bean and Dark Cacao flavor – would love to try their other flavors too thou! Yum! Stinger – I love this brand and all their waffle wafers, mmm honey on anything is good to me! Aloha Daily Good Greens Dietary Supplement – perfect to add to your smoothie! Smart Crackers Maple Carrot Crisp – A full box! Nice! These have half a serving of veggies, and contain actually dehydrated organic carrots! The tasting box starts at only $7.99 a month with free US shipping and a free box for an annual subscription and includes 8+ items. The Deluxe starts at only $16.50 for 16-20 items and a free bonus box for an annual subscription, with free US shipping and $3.99 international shipping. 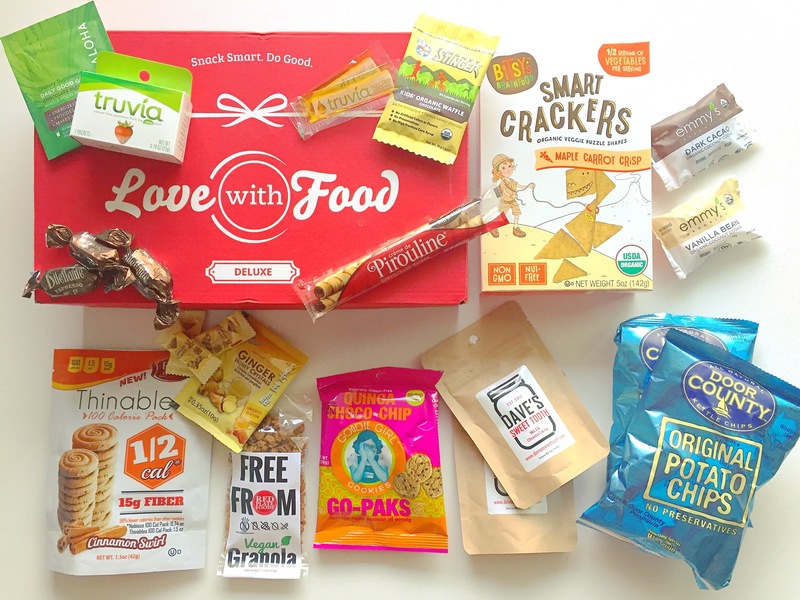 The Gluten Free box starts at only $19.99 for an annual subscription and includes 10-12 items.